Description: Discover her routine and help the Mermaid Princess get ready for the concert. Start the spa treatment session with seaweeds and seashells. 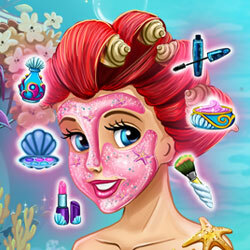 After all the beauty masks are applied you can start the under sea makeup session on a clean skin. Choose from a variety of lipsticks, eye shadows and blushes and match them perfectly for our princess. Pick up a spectacular hairstyle, a beautiful mermaid tail and an elegant top, then match it all together with royal accessories.